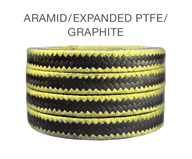 Expanded Teflon®, lubricated, graphite impregnated with tough aramid fibre reinforcing braid. General chemical service where slurries or pressures in excess of 300 psi are typically encountered. Abrasive slurries, pulp stock, mine effluent, asphalt and produced water in oilfield production applications.